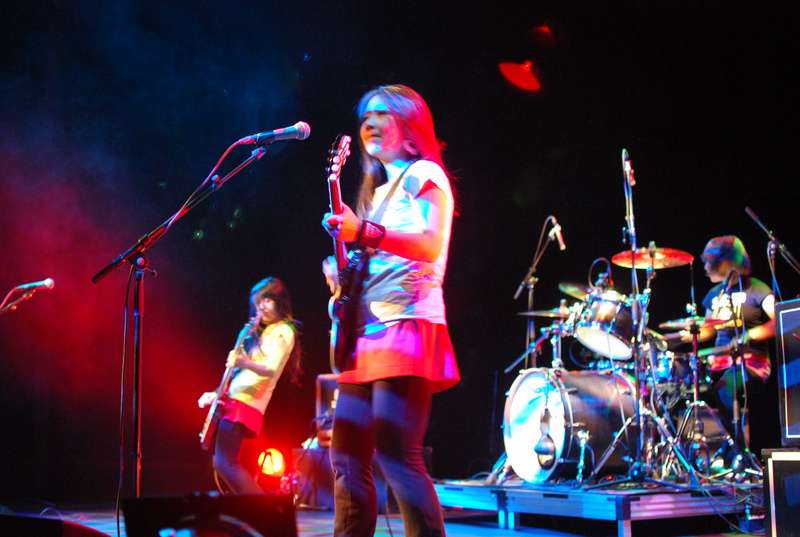 They’ve toured with Nirvana, recorded with John Peel, and in 1989, twenty-two alt rock bands on the American scene covered their songs on the tribute album Every Band Has a Shonen Knife Who Loves Them. The band’s been rocking for 32 years and judging by the show they put on to kick off the Camera Japan festival in Rotterdam a couple of nights ago, there’s no stopping them. 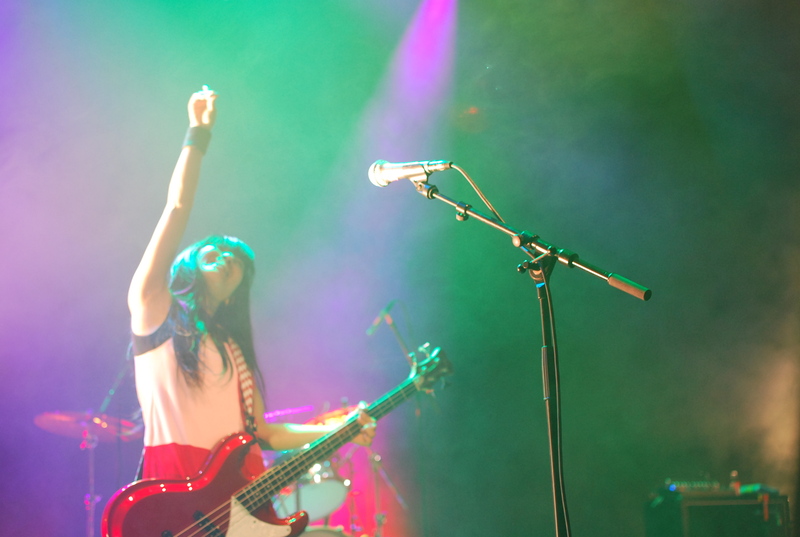 Starting with Pop Tune from their 2012 album of the same name, the band launched into an infectious mix of punk rock, bubblegum pop, guitar riffs, live-wire drumming by Emi, and cute lyrics in accented English. I Am a Cat, Banana Chips, Cycling is Fun, Barbecue Party, Osaka Rock City, Sushi Bar Song… There wasn’t a great deal to differentiate between the songs, but the formula was irresistibly charming with an edge. Obviously highly choreographed and just as tightly formulated as the music, the onstage moves still added to the fresh and spontaneous feel. I wondered if perhaps the tight control is the fabric that supports the exuberance. To sound so fresh after thirty-two years, 18 albums and many changes to the band lineup is quite an achievement. 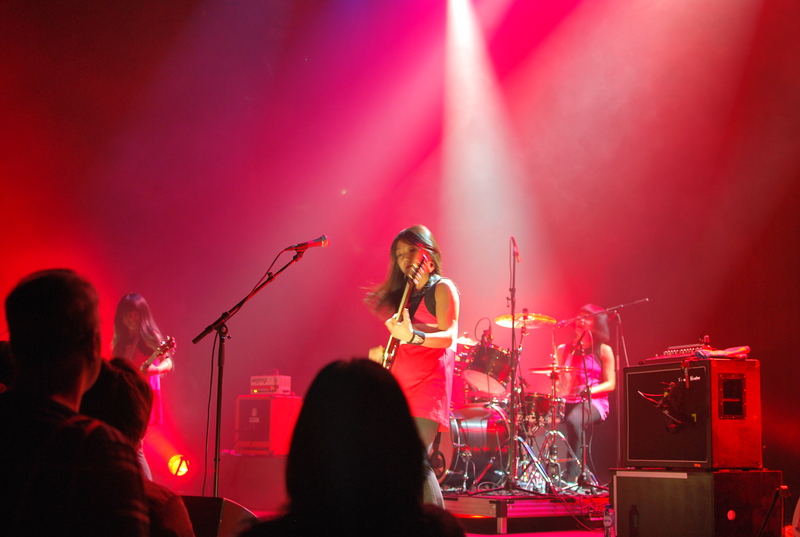 The band may look like Hello Kitty with guitars, but they are hard-core professionals. After the show, they did an autograph session, so I am now the proud owner of a signed copy of Osaka Ramones, A Tribute to the Ramones, released two years ago when Shonen Knife celebrated their 30th anniversary. 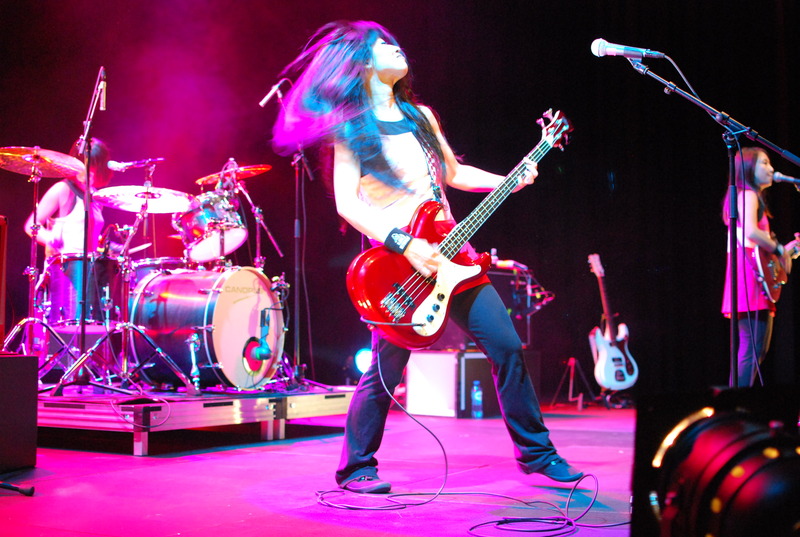 The Ramones is the band that inspired Naoko to form Shonen Knife in Japan in 1981. She heard their music on the radio, and the rest is history. A funny thing happened when they signed the CD for me. Obviously, I spoke to them in Japanese and Ritsuko turned to me and asked if I could recommend some good Dutch food. I was so surprised that I blurted out the truth, “There isn’t any.” Afterwards I felt quite bad about it because that is so-not Japanese. You always come up with some sort of qualifier, but I was starstruck and my mind went blank. Here’s a taster of their music. Pop Tune is more bubblegum than punk, but there are hints of what the band can do. Well, there is cheese of course and … cheese with seeds in it. They look great! Now to go and listen to them. You were a bit saucy here, Lis-Britt.